The probability of a tornado within 25 miles of a point. If a hatched area is included in the image, which is only done with probabilities of 10 percent or higher, strong tornadoes are more of a concern than normal. The following tornado probabilities correspond to each SPC storm risk category. Organized risk of severe storms begins with “marginal” (MRGL). Levels increase from there to “slight” (SLGT), then “enhanced” (ENH), next is “moderate” (MDT), and finally “high” (HIGH). In a marginal risk, one might expect mostly non severe storms, with perhaps an isolated severe weather incident. Severity is up from there, from short-lived in slight to more persistent in enhanced, long-lived in moderate, and exceptional in high. SPC has a graphic covering differences. Watches, either tornado (red) or severe thunderstorm (blue), indicate that storms are likely to pose the highlighted threat. Tornadoes also occur in severe thunderstorm watches fairly frequently. A surface feature analysis often tells the basic story of any weather setup. 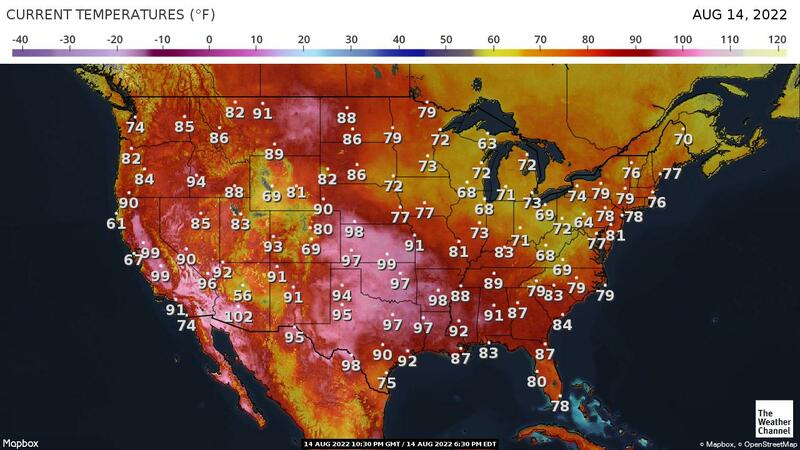 High pressure? Probably sunny. Low pressure? Probably stormy. When it comes to tornadoes, your classic setups involve a low pressure system (little red L above) to the northwest or west of the area of primary severe risk. Other features that help produce tornadoes include wind shift zones like the warm front (red lines with half-circle bubbles pointing in the direction of movement), surface trough/dry line (dashed orange line, often connected to a low), and in some cases the cold front (blue line with arrows pointing in the direction of movement). Weather observations are critical to any severe storm forecast. The chart above is a simple one, and similar to the general surface feature map just above. When it comes to tornado forecasting, the quick items to look for in actual station observations that aren’t explicitly in the features map include: surface winds and temperatures, as well as dew points (more detail on that below). A critical component in tornadogenesis is “backing” low-level winds. In many warm-season cases, that means a southeasterly wind or close. In general, winds with a lengthy southerly component will efficiently transport moisture northward. Where winds shift, fronts or boundaries can be found. 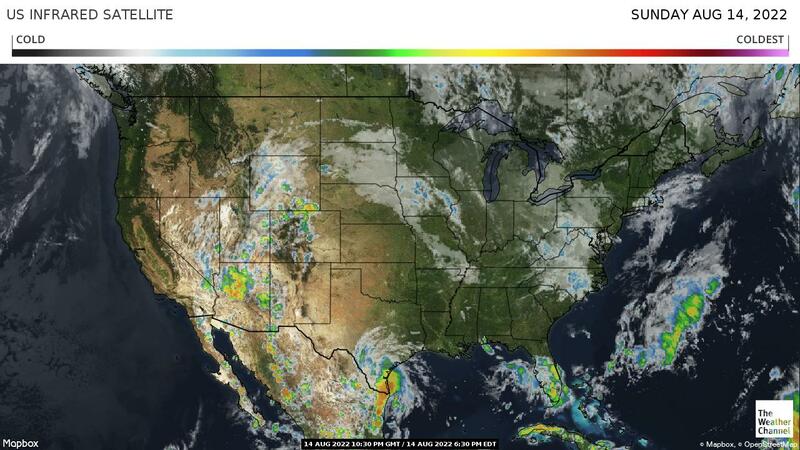 CAPE, or Convective Available Potential Energy, is among the necessary ingredients for storms. If CAPE is zero, the atmosphere is stable. Measured in Joules per kilogram (j/kg), values near or over 500-1,000 j/kg are often about the low-end needed for widespread severe weather chances. Values over 3,000-4,000 are considered extremely unstable, often indicative of a high-end severe weather event. There are several layers of the atmosphere in which CAPE is measured, with surface CAPE among the most used to determine thunderstorm potential and gauge a severity ceiling. Bulk shear, or deep layer shear, is defined as the change in wind speed or direction within the lowest 6 km or 3.5 miles of the atmosphere. Bulk shear values of 40 knots or greater are supportive of supercells. Values lower, say between 30 and 40 knots, may also support supercells or supercell structures depending on the terrain and other ingredients. Larger bulk shear values tend to correlate to higher tornado potential, to a point at least. Supercell composite is an index that includes several severe weather ingredients. The ingredients are effective storm-relative helicity, most unstable CAPE (muCAPE), and effective bulk wind difference. Values of 1 or greater indicate an increased potential for right-moving supercells, should storms fire or move into the region highlighted by the supercell composite index. More details can be found here. The significant tornado parameter (effective layer) is another composite index. Like the supercell composite, it contains several ingredients. The soup that makes up the significant tornado parameter includes effective bulk wind difference, effective storm-relative helicity, 100mb mean parcel CAPE (mlCAPE), and 100mb mean parcel height (mILCL). Values greater than 1 have been associated with a majority of tornadoes that have been rated significant/strong (which is a rating of F/EF2 or greater). Non-tornadic supercells, on the other hand, are often associated with significant tornado parameters of less than 1. The Lifting Condensation Level (LCL) is the pressure level at which air reaches saturation upon being lifted. In more basic terms, it is often roughly where the base of a cloud should form as thunderstorm convection occurs during the warm season. Research has found that supercell tornadoes generally require LCLs below 1,500 meters. Strong tornadoes are more common with LCLs below 1,000 meters, and probably more in the 600 to 800 meter zone or lower. LCLs are often lower in a storm environment than shown in a large-scale analyses like above. This page is undergoing development. “SLGT” is a shortened form of “slight” risk on the convective outlook map. Hi Romanatwood. 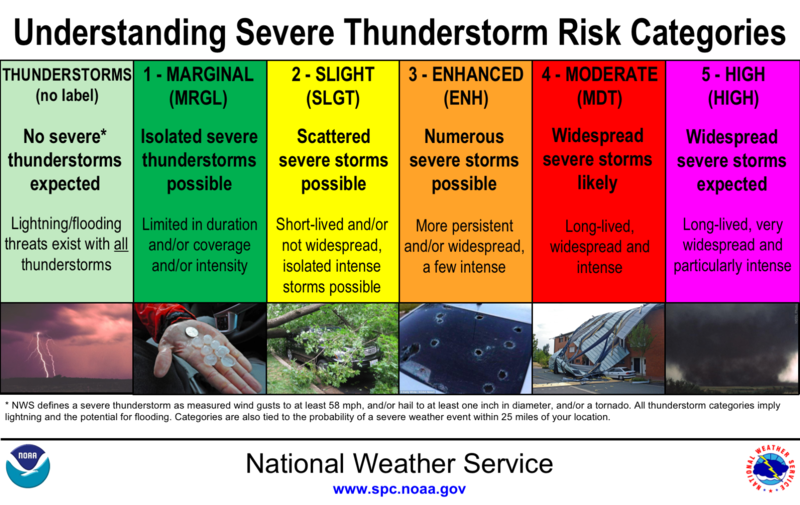 They represent “Marginal”, “Moderate”, and “Enhanced” risk for severe weather. Go to the links Ian shared in his reply above, and they will explain what each type of risk means. thanks so much for a wonderful site with an enormous ammount of CLEAR information! This is a good website and it’s very informative!! I have a few questions. Do/have tornados touched down in the same or general spot a number of times? I’m not talking about same cities hit over and over, but has the start point been the same? If so, hasn’t there been research done in regards to this as in, ground temps, humidity levels, barometric pressure readings, low and high level air temps in each recurrent case to find a correlation to add to the mystery of the other components of tornados?? What is the probability of an overnight tornado in nova, just 30 minutes south of DC, 45 north of fredericksburg?